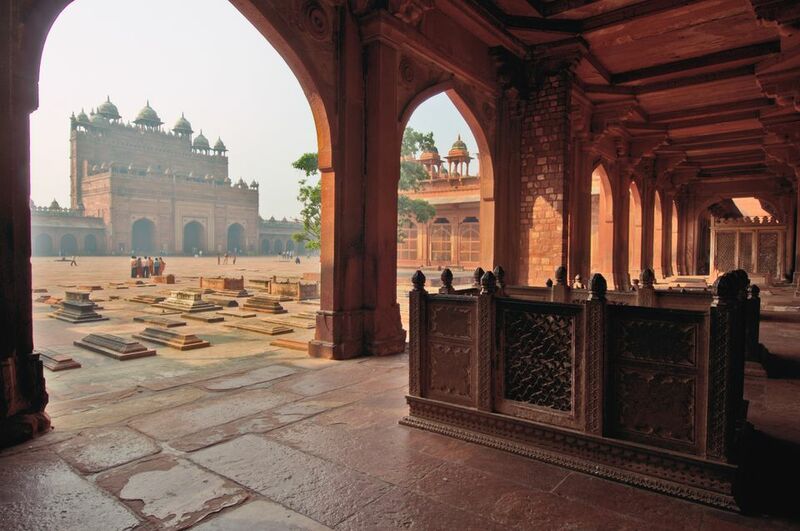 A city that was once the proud capital of the Mughal Empire in the 16th century, Fatehpur Sikri now stands deserted as a well-preserved ghost town. It was abandoned by its occupants after only 15 years due to an insufficient water supply. Fatehpur Sikri was established by Emperor Akbar from the twin villages of Fatehpur and Sikri as a tribute to the famous Sufi saint, Sheikh Salim Chishti. The saint accurately predicted the birth of Emperor Akbar's much longed for son. Approximately 40 kilometers (25 miles) west of Agra, in Uttar Pradesh. The most convenient way to visit Fatehpur Sikri is on a day trip from Agra. A taxi will cost around 1,800 rupees return. Alternatively, you can travel by bus for less than 50 rupees. For an authentic Indian village experience, do stop at Korai Village on the way. If you wish to go on a tour, Viator includes Fatehpur Sikri on many of its private tours. Alternatively, Agra Magic runs a private three-hour tour to Fatehpur Sikri. The best time to visit is during the cooler dry weather from November to March. It's open from sunrise until sunset. Aim to go early in the morning when it's less crowded and quieter. Fatehpur Sikri, constructed out of red sandstone, is made up of two different parts surrounded by a fortification wall. Fatehpur is a religious place, with Jama Masjid (mosque) and the tomb of Sufi saint Salim Chishti located behind the towering Buland Darwaza (Gate of Magnificence). It's free to enter. Sikri, the main attraction, has the unorthodox palace complex where Emperor Akbar, his three wives, and son lived. A ticket is required to enter it. The ticket price is 510 rupees for foreigners and 40 rupees for Indians. Children younger than 15 years are free. The palace complex has two entry gates, Diwan-e-Am and Jodha Bhai, where tickets can be purchased. Diwan-e-Am is the main gate, and there's also a free Archaeological Museum near it that's open daily from 9.00 am to 5.00 p.m. except for Friday. The palace complex curiously combines Islamic, Hindu and Christian architecture, reflective of the religions of Akbar's three wives. Inside the complex, the Diwan-e-Khas (Hall of Private Audiences) is a magnificent structure featuring a single pillar (the Lotus Throne pillar) that apparently supported Akbar's throne. Other highlights are the famous five-storied Panch Mahal (palace), and immaculately carved Jodha Bai Palace. This palace is the most elaborate and complete structure in the complex and is where Akbar's principal wife (and mother of his son) lived. Another attraction that's off-the-beaten-track and worth visiting is the unusual Hiran Minar. To reach this spiky tower, walk down the steep stone path through the palace complex's Elephant Gate. Ask your guide to take you there. Some people say that Akbar used to watch antelope (hiran) from the top of the tower. Others say it was built over the tomb of Akbar's favorite elephant named Hiran, which executed people by walking over them and crushing their chests. It's encrusted with stone elephant tusks. Buland Darwaza and the tomb of Sheikh Salim Chisti are situated near Jodha Bhai gate. Fatehpur Sikri is unfortunately dominated by the multitude of hawkers, beggars, and touts that roam uncontrolled. Prepare to be very persistently and aggressively harassed from the moment you arrive. This is not the time to appear friendly. Rather, ignore them or be as assertive as you have to be to get rid of them. Otherwise, they will pursue you relentlessly and extract as much money from you as possible. The problem has reached such a level that many tour companies are no longer including Fatehpur Sikri on their itineraries. Even more concerning, two Swiss tourists were severely injured by a group of local youths at Fatehpur Sikri in October 2017. When coming from Agra or Jaipur, you'll most likely enter Fatehpur Sikri through Agra Gate (although there is a lesser-used rear gate). Vehicles are required to park in the car park near the entrance. It's situated in between Fatehpur and Sikri but quite a distance away from the sites. The parking fee is 60 rupees. A government shuttle bus, costing 10 rupees per person, transports visitors to the Sikri palace complex. The buses run in two different directions, to the Diwan-e-Am and Jodha Bhai entry gates. If you're feeling energetic and it's not too hot, you can walk. Touts in the car park will invariably try to entice you to take a costly auto-rickshaw, or insist that you visit Fatehpur first. It's also guaranteed that you'll be approached by fake tourist guides, many of them young children. Fatehpur, in particular, is overrun with hawkers, beggars, pickpockets, and touts, as it is free to enter. The fake guides are most active around the road leading to Buland Darwaza and Jama Masjid. Licensed guides are available in front of the ticket counter at the Diwan-e-Am gate. Take a guide from there only, or get your travel agent (if you have one) to arrange for a guide to meet you in the car park. Don't be misled by the fake guides elsewhere. You'll need to take your shoes off to enter Buland Darwaza (you can carry them with you). Unfortunately, the area is dirty and not well maintained. Watch out for the people who will approach you an insist that you buy a piece of cloth, said to bring good luck, to put over the tomb when you visit. The quoted price may be as much as 1,000 rupees! However, the cloth will be taken away and resold to the next gullible tourist soon after you've laid it. Accommodations are limited at Fatehpur Sikri so it's a good idea to stay in Agra. However, if you want to be close to the site, the Goverdhan Tourist Complex is a basic but decent place. It's clean with hot water, and prices range from 750 rupees to 1,250 rupees per night depending on the size of the room. Another option, popular with backpackers, is the inexpensive Sunset View Guest House. Alternatively stay in Bharatpur, 25 minutes away, and check out the Bharatpur Bird Sanctuary (also known as Keoladeo Ghana National Park) there as well.